The Sazerac House in New Orleans imported Cognac Sazerac, after which the house itself was named. A cocktail based on Cognac Sazerac may have been first made at the Sazerac House, but maybe not. The true cocktail was a very popular and common type of drink all throughout the United States in the nineteenth century. There is a small chain of bars called Hennessey’s, and they serve Hennessy Cognac. But to assume that a Hennessy Sidecar must have been first made at Hennessey’s tavern would probably be an error. As of yet, there is no proof that a Sazerac Cocktail, absinthe-accented or not, was first made at the Sazerac House. It would not surprise me if it were, but it is a matter of speculation. Some might be tempted to consider this an early reference to what is thought of today as the Sazerac Cocktail. But, the Sazerac that Bob makes metaphor-of as being given out to an election crowd is most simply to be understood as Sazerac brandy itself, rather than a mixed drink. It would be just as wrong to take the lone word “Sazerac” in a nineteenth century source and assume that “Sazerac Cocktail” was meant as it would be to take the lone word “Sherry” in the same source and assume that “Sherry Cobbler” was meant. 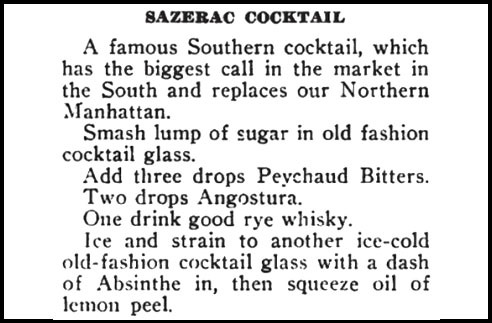 The earliest recipe for a Sazerac Cocktail that I could find is in William Boothby’s book, The World’s Drinks and How To Mix Them – published in 1908. The oldest recipe for the whiskey-based Zazarack Cocktail (or Zazerac Cocktail) that I could find is in the book Jack’s Manual on the Vintage and Production, Care and Handling of Wines, Liquors, Etc. by Jacob Grohusko from the year 1910. In that source it is called the Zazarack Cocktail. So, the 1908 Sazerac Cocktail is based upon brandy and the 1910 Zazarack Cocktail is based upon whiskey. Another early source presents the Zazarack Cocktail (called in the source the “Sazerac Cocktail” even though it contains no Sazerac brandy) as being based upon rye whiskey instead of Bourbon. It is the book Beverages de Luxe, edited by George R. Washburne and Stanley Bronner, and published in 1914. It is given as being a specialty of the Saint Charles Hotel in New Orleans, Louisiana. 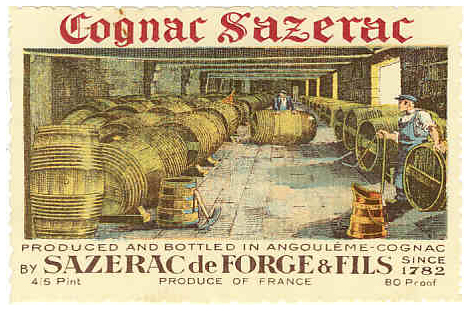 By the 1930’s, both the Sazerac Cocktail and the Zazarack Cocktail were being made with pastis liqueur (such as that by Pernod) as a substitute for the absinthe that had been banned in many parts of the drinking world. So, there you have it – the de-mythified history of both the Sazerac Cocktail and its sibling, the Zazarack Cocktail. Set all the wistful bar-lore aside and enjoy both of these drinks. Use a good Cognac brandy for the Sazerac Cocktail and a good straight rye whiskey for the Zazarack Cocktail. I also recommend using absinthe instead of pastis liqueur. Enjoy!